The scope of this section satisfies that required by the IPCC plenary in relation to future impacts on properties, goods and services of major ecosystems and on biodiversity. However, to assess ecosystem goods and services more completely, issues relating to biogeochemical cycling and other supporting or regulating services are also deemed appropriate for consideration under this heading. Following reviews of impacts on individual ecosystems, impacts that cut across ecosystems (such as large-scale vegetation shifts and migratory species) are elaborated. Finally the overall implications for biodiversity are highlighted in a global synthesis. Within the relevant subsections, we describe briefly ecosystem properties, goods and services, we summarise key vulnerabilities as identified by the TAR, and then review what new information is available on impacts, focusing on supporting and regulating services (for provisioning services see Chapters 3,5 and 6). The cycling of chemical elements and compounds sustains the function of the biosphere and links ecosystems and climate by regulating chemical concentrations in soil, biota, atmosphere and ocean. Substantial progress has been made since the TAR in understanding the interactive responses of terrestrial ecosystems and the climate system, as determined by plant physiological responses, interactions with the soil, and their scaled-up effects on regional and global biogeochemical cycles (Buchmann, 2002; Cox et al., 2006; Friedlingstein et al., 2006; Gedney et al., 2006). Interactions between ocean and atmosphere and land and oceans are also critical for the future evolution of climate (see Section 4.4.9, but mainly Denman et al., 2007, e.g., Section 7.3.5.4). Among the most advanced tools to achieve scaling-up of terrestrial systems to the global scale are Dynamic Global Vegetation Models (DGVMs), which simulate time-dependent changes in vegetation distribution and properties, and allow mapping of changes in ecosystem function and services (Schröter et al., 2005; Metzger et al., 2006). Testing at hierarchical levels from leaf to biome and over relevant time-scales has shown encouraging agreement with observations (Lucht et al., 2002; Bachelet et al., 2003; Harrison and Prentice, 2003; Gerten et al., 2004; Joos and Prentice, 2004; Kohler et al., 2005; Peylin et al., 2005), and validation is ongoing (e.g., Woodward and Lomas, 2004b; Prentice et al., 2007). Recently, full coupling between DGVMs and climate models has progressed from earlier work (e.g., Woodward and Lomas, 2001) to explore feedback effects between biosphere and atmospheric processes (Cox et al., 2006; Friedlingstein et al., 2006), that were initially reported as having significant implications for the carbon cycle (Cox et al., 2000). Ecosystems are likely to respond to increasing external forcing in a non-linear manner. Most initial ecosystem responses appear to dampen change (Aber et al., 2001), but amplify it if thresholds in magnitude or rate of change are surpassed. Transitions between states may be triggered, or the ecosystem may even 'collapse' i.e., show a rapid transition to a much less productive and/or species-poor assemblage with lower biomass and other impairments such as degrading soils (e.g., Scheffer et al., 2001; Rietkerk et al., 2004; Schröder et al., 2005). Changing fire regimes provide an important example (see Section 4.2.2 for a more complete treatment), as these are of significant concern for the terrestrial carbon balance (Schimel and Baker, 2002; van der Werf et al., 2004; Westerling et al., 2006), especially because they can be self-reinforcing (Bond and Keeley, 2005). However, even less extreme responses of ecosystems are likely to have important ramifications for the biosphere because of their spatial extent. Based on early versions of DGVMs (equilibrium biogeography models or global biogeochemical models -Neilson et al., 1998), the world's terrestrial ecosystems were projected to continue as a net carbon sink for a number of decades and possibly throughout the 21st century, with an initially 'greening' world due to longer growing seasons, more precipitation and CO2-fertilisation benefits. Substantial structural changes in biomes were projected towards 2100, with ecosystem shifts towards higher latitudes and altitudes. A reversal of initial carbon sequestration gains was projected during the 21st century, as CO2-fertilisation benefits approach saturation and temperature effects on respiration and transpiration increase, potentially resulting in net global ecosystem carbon losses relative to today (e.g., Cramer et al., 2001). With feedback from the global carbon cycle to the atmosphere accounted for, dieback of much of the Amazon rainforest due to desiccation was an identified major vulnerability, but with a high degree of uncertainty (Cox et al., 2000). The TAR concluded that the net global terrestrial carbon exchange would be between -6.7 PgC/yr (uptake 1 PgC) and +0.4 PgC/yr, and that anthropogenic CO2 emissions would remain the dominant determinant of atmospheric CO2 concentration during the 21st century. Key ecosystem forecasting needs identified in the TAR were for spatially and temporally dynamic models to simulate processes that produce inertia and lags in ecosystem responses. Progress on this issue has now allowed initial assessments of the potential for feedbacks from ecosystems to atmospheric composition and climate change. Observations for global net primary productivity (NPP) from 1982 to 1999 show an increase of 6%, concentrated in the tropics and due virtually certainly to greater solar radiation with reduced cloud cover (Nemani et al., 2003), broadly concurring with the projection in the TAR of an increasing biospheric sink in the initial stages of climate change. Scaled-up effects of direct atmospheric CO2 enrichment on plant and ecosystem biomass accumulation (CO2-fertilisation) are largely responsible for the projected continued enhancement of NPP in current global models (Leemans et al., 2002). By contrast, impacts in oceans, especially through acidification, have been largely negative (see Section 4.4.9). 2002), highlighting the significant influence of co-limiting environmental variables. It has been suggested that greatest CO2-fertilisation impacts may be seen in savanna systems post-fire (Bond and Midgley, 2000; Bond et al., 2003), especially where nutrients are less limiting and in systems in which trees require carbon reserves to re-establish after fire (see Section 4.2.2). Scrub oak in Florida shows diminishing CO2 responses as treatment proceeds (Hungate et al., 2006), even though this is a post-fire regenerating system. For tropical forests, the planet's single largest biomass carbon reservoir, post-industrial atmospheric CO2 enrichment seems to have enhanced growth dynamics (Phillips et al., 2002; Laurance et al., 2004; Wright et al., 2004). A more dynamic forest might ultimately store less rather than more carbon in future if long-term species compositional changes are realised (Laurance et al., 2004; Malhi et al., 2006), especially given the exceptional CO2 responsiveness of tropical lianas that may increase tree mortalities and population turnover (Körner, 2004). Based on experimental data, best estimates of instantaneous CO2-induced water savings due to reduced stomatal aperture range from 5 to 15% (Wullschleger and Norby, 2001; Cech et al., 2003) for humid conditions, diminishing with drying soils. Desert shrub systems increase production in elevated CO2 only during exceptional wet periods and not in dry periods (Nowak et al., 2004), contrasting with earlier expectations (Morgan et al., 2004). Evapotranspiration data for temperate zone ecosystems under future CO2 scenarios suggest that this may be reduced by less than 10% across all weather conditions. Water savings through elevated CO2 hold limited benefits for trees during drought, because nutrient availability in drying top soil becomes interrupted, and initial water savings are exhausted (Leuzinger et al., 2005). Repeated drought with high temperatures (e.g., Europe in 2003, Box 4.1) may reduce landscape-wide carbon stocks (Ciais et al., 2005). Studies using a land-surface model indicate at least for the past century a hydrological response up to the global scale of increasing runoff (e.g., Gedney et al., 2006) that is consistent with expected stomatal responses to rising CO2 (e.g., Hetherington and Woodward, 2003; Gedney et al., 2006). Soil nitrogen availability is key to predicting future carbon sequestration by terrestrial ecosystems (Reich et al., 2006), especially in light of global nitrogen-deposition trends (2-10 fold increase in some industrialised areas - Matson et al., 2002). The future ability of ecosystems overall to sequester additional carbon is very likely to be constrained by levels of nitrogen availability and fixation, and other key nutrients such as phosphorus that may also become increasingly limiting (Hungate et al., 2003). Carbon accumulation and sequestration in critical soil stocks (see Figure 4.1) has been found to be strongly nitrogen-constrained, both because levels well above typical atmospheric inputs are needed to stimulate soil C-sequestration, and because natural N2-fixation appears to be particularly strongly limited by key nutrients (van Groenigen et al., 2006). Results from a loblolly pine forest (Lichter et al., 2005) and grassland experiments (Van Kessel et al., 2000) suggest a reduced likelihood for CO2-fertilisation-driven carbon accumulation in soils, probably because carbon sequestration to humus is more nutrient-demanding (not only nitrogen), than is wood formation, for example (Hungate et al., 2006). Carbon accretion in soil is therefore itself likely to exert negative feedback on plant growth by immobilising soil nutrients (in addition to cation depletion by acidic precipitation), contributing to a faster diminishing of the biospheric sink (see Figure 4.2; Reich et al., 2006) than implemented in model projections (e.g., Scholze et al., 2006; see Figure 4.2). Accumulation of seasonally transitory soil carbon pools such as in fine roots has been found at elevated ambient CO2 concentrations, but the general validity of such enhanced C-fluxes and what fraction of these might be sequestered to recalcitrant (see Glossary) soil carbon stocks remains unresolved (Norby et al., 2004). 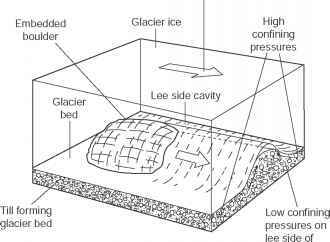 Soil warming may enhance carbon emissions, especially by reducing labile soil organic carbon pools (Davidson and Janssens, 2006). This results in the commonly observed short-term (less than decadal) loss of carbon in warming experiments, followed by the reestablishment of a new equilibrium between inputs and losses of soil carbon (e.g., Eliasson et al., 2005; Knorr et al., 2005). Recent observations indeed show widespread carbon losses from soils (Bellamy et al., 2005; Schulze and Freibauer, 2005) that are consistent with this formulation. However, in regions with thawing permafrost, a decay of historically accumulated soil carbon stocks (yedoma, >10,000 years old, Figure 4.1) due to warming (Zimov et al., 2006) and nutrient deposition (Blodau, 2002; Mack et al., 2004) could release large amounts of carbon to the atmosphere (see also Section 4.4.6). Increased NPP (but see Angert et al., 2005) and vegetation change (see Section 4.4.5 and, e.g., Sturm et al., 2001) may partly counterbalance this carbon release (see Section 4.4.6 and Sitch et al., 2007), thus complicating projections (Blodau, 2002; for a full discussion see Section 4.4.6). Ecosystem changes associated with land-use and land-cover change (see Section 4.2.2) are complex, involving a number of feedbacks (Lepers et al., 2005; Reid et al., 2005). For example, conversion of natural vegetation to agricultural land drives climate change by altering regional albedo and latent heat flux, causing additional summer warming in key regions in the boreal and Amazon regions, and winter cooling in the Asian boreal zone (Chapin et al., 2005b; Feddema et al., 2005), by releasing CO2 via losses of biomass and soil carbon (Gitz and Ciais, 2003; Canadell et al., 2004; Levy et al., 2004) and through a 'land-use amplifier effect' (Gitz and Ciais, 2003). In contrast, reforestation, and other land-use or land-management changes such as modifications of agricultural practices, can work to mitigate climate change through carbon sequestration (Lal, 2003,2004; Jones and Donnelly, 2004; King et al., 2004a; Wang et al., 2004a; de Koning et al., 2005; Nabuurs et al., 2007). This mitigation potential is probably limited to reducing the ultimate atmospheric CO2 increase by 2100 by between 40 and 70 ppm (House et al., 2002), and by approximately century-long time-lags until mature forests are established (see Sections 4.4.5, 4.4.6 and 4.4.10), and is probably offset by regional warming effects of lower albedo with poleward boreal forest expansion (e.g., Betts, 2000; for a full discussion see Section 4.4.6). The sequestration and cycling of carbon in terrestrial ecosystems is a key vulnerability, given the above drivers, their generally global extent, their potential irreversibility, and the likely existence of threshold-type impacts. The extent to which the recently discovered methane release from plant foliage (Keppler et al., 2006) can be scaled to biome level is under debate (Houweling et al., 2006), and highlights the currently limited understanding of the methane cycle, and its exclusion from Earth system models (e.g., Betts and Shugart, 2005). Nonetheless, recent work especially with DGVM approaches, has begun to elucidate the likelihood of occurrence of important thresholds, and positive feedback to the atmosphere through diminishing CO2 sequestration or even net carbon release from ecosystems, thus amplifying climate change (e.g., Friedlingstein et al., 2006; Lucht et al., 2006; Scholze et al., 2006). 2100 (Woodward and Lomas, 2004b; see also next paragraph, Figure 4.2). More recent modelling based on projected deforestation and climate change (for the IS92a emissions scenario and the CGCM1, CSIRO, ECHAM, HadCM3 climate models) in the tropics alone suggests an additional release of 101 to 367 PgC, adding between 29 and 129 ppm to global atmospheric CO2 by 2100, mainly due to deforestation (Cramer et al., 2004). Climate scenario uncertainty provides a substantial variance in global terrestrial C balance by 2100, even under a single CO2 emissions scenario (IS92a, projected to reach 703 ppm atmospheric CO2 concentration by 2100, excluding vegetation feedback). Using five General Circulation Models (GCMs) to drive DGVMs, global terrestrial C-sequestration is estimated at between -106 and +201 PgC (Schaphoff et al., 2006), though in four out of five, the sink service decreased well before 2060. A risk assessment for terrestrial biomes and biogeochemical cycling shows that a terrestrial carbon source is predicted in almost half of 52 GCM x emissions scenario combinations, and that wildfire frequency increases dramatically even for a warming of <2°C by 2100 (Scholze et al., 2006). Here we show model results for the most recent version of the DGVM Lund-Potsdam-Jena Model (LPJ) (Schaphoff et al., 2006) highlighting changes in biome structure (relative cover of dominant growth forms) and the terrestrial carbon sink under more recent IPCC emissions scenarios SRES A2 and B1 (Nakicenovic et al., 2000). This supports projections of diminishing terrestrial C-sequestration as early as 2030 (Figure 4.2) - earlier than suggested in the TAR (Prentice et al., 2001, Figure 3.10) - and substantial shifts in biome structure (Figure 4.3); discussed more fully in Sections 4.4.10 and 4.4.11. Figure 4.2. Net carbon exchange of all terrestrial ecosystems as simulated by the DGVM LPJ (Sitch et al., 2003; Gerten et al., 2004 -negative values mean a carbon sink, positive values carbon losses to the atmosphere). 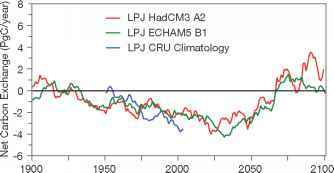 Past century data are based on observations and climate model data were normalised to be in accord with these observations for the 1961-1990 data (CRU-PIK). Transient future projections are for the SRES A2 and B1 emissions scenarios Nakicenovic et al., 2000), forcing the climate models HadCM3 and ECHAM5, respectively (cf. Luchtetal., 2006; Schaphoff et al., 2006). In contrast to previous global projections (Prentice et al., 2001 -Figure 3.10), the world's ecosystems sink service saturates earlier (about 2030) and the terrestrial biosphere tends to become a carbon source earlier (about 2070) and more consistently, corroborating other projections of increased forcing from biogenic terrestrial sources (e.g., Cox et al., 2000, 2004; White et al., 2000a; Lucht et al., 2006; Schaphoff et al., 2006; Scholze et al., 2006; see Figure 4.3 for maps on underlying ecosystem changes). Note that these projections assume an effective CO2-fertilisation (see Section 4.4.1). Projections from modelling that dynamically link the physical climate system and vegetation, using Ocean-Atmosphere General Circulation Models (OAGCMs, e.g., Cox et al., 2000), suggest a terrestrial C source that will exacerbate both climate and further vegetation change to at least some degree (e.g., Sarmiento, 2000; Dufresne et al., 2002; Canadell et al., 2004). Impacts include the collapse of the Amazon forest (e.g., White et al., 2000a; Cox et al., 2004), and an overall C source from the tropics that exceeds the boreal C sink (Berthelot et al., 2002), leading to an 18% (Dufresne et al., 2002), 5 to 30% (Friedlingstein et al., 2006), and 40% (Cox et al., 2000) higher atmospheric CO2 concentration by 2100. Carbon and water cycling, at least, are also affected by shifting biogeographical zones (Gerten et al., 2005) which will be lagged by migration constraints that are not yet incorporated in DGVM approaches (see also Sections 4.4.5 and 4.4.6), leading to a potential overestimation of vegetation C-sequestration potential. This is especially so for boreal regions, due to unrealistically high projections of in-migration rates of trees and shrubs (Neilson et al., 2005). Changes in air-sea fluxes of dimethyl sulphide (DMS) from -15% to 30% caused by global warming of about 2°C are projected to have a regional radiative and related climatic impact (Bopp et al., 2003, 2004), as DMS is a significant source of cloud condensation nuclei. DMS is produced by coccolithophores, which are sensitive to high sea-water CO2 (Riebesell et al., 2000). As the largest producers of calcite on the planet (Holligan et al., 1993), reduced calcification by these organisms may also influence the global carbon cycle (Raven et al., 2005) and global albedo (Tyrrell et al., 1999). N2O of marine origin contributes about 33% of total input to the atmosphere (Enhalt and Prather, 2001). Changes to the concentration and distribution of oxygen in the oceans, either through increased stratification of the surface waters (Sarmiento et al., 1998) or through a decrease in the strength of the thermohaline circulation (IPCC, 2001), will impact the ocean nitrogen cycling, especially the processes of nitrification and denitrification which promote N2O production. One of the largest terrestrial biomes, deserts cover 27.7 Mkm2, comprising extra-polar regions with mean annual precipitation <250 mm and an unfavourable precipitation to potential evaporation ratio (Nicholson, 2002; Warner, 2004; Reid et al., 2005). Deserts support on the order of 10 people per km2, in sparse populations with among the lowest gross domestic product (GDP) of all ecoregions (Reid et al., 2005). Recent estimates suggest that between 10 and 20% of deserts and drylands are degraded due to an imbalance between demand for and supply of ecosystem services (Adeel et al., 2005). Critical provisioning goods and services include wild food sources, forage and rangeland grazing, fuel, building materials, and water for humans and livestock, for irrigation and for sanitation, and genetic resources, especially of arid-adapted species (Adeel et al., 2005; Hassan et al., 2005). Regulating services include air quality, atmosphere composition and climate regulation (Hassan et al., 2005), especially through wind-blown dust and desert albedo influences on regional rainfall, and biogeochemistry of remote terrestrial and marine ecosystems (Warner, 2004). The TAR noted several vulnerabilities in drylands (Gitay et al., 2001, p. 239) but chiefly that human overuse and land degradation, exacerbated by an overall lack of infrastructure and investment in resource management, would be very likely to overwhelm climate change impacts, with the exception of impacts of increased dry and wet extremes due to ENSO frequency increase, and negative impacts of projected warming and drying in high biodiversity regions. On the other hand, evidence for region-specific increases in productivity and even community compositional change due to rising atmospheric CO2 was reported, with associated increased biomass and soil organic matter. Overall impacts of elevated CO2 were reported as comparable, though usually opposite in sign, to climate change projections. Since the TAR, further work shows that desert biodiversity is likely to be vulnerable to climate change (Reid et al., 2005), with winter-rainfall desert vegetation and plant and animal species especially vulnerable to drier and warmer conditions (Lenihan et al., 2003; Simmons et al., 2004; Musil et al., 2005; Malcolm et al., 2006), and continental deserts vulnerable to desiccation and even soil mobilisation, especially with human land-use pressures (Thomas and Leason, 2005). However, the potentially positive impact of rising atmospheric CO2 remains a significant uncertainty, especially because it is likely to increase plant productivity, particularly of C3 plants (Thuiller et al., 2006b) and, together with rainfall change, could even induce wildfires (Bachelet et al., 2001; Hardy, 2003; Duraiappah et al., 2005). The uncertain impact of elevated CO2 on vegetation productivity and biogeochemical cycling in deserts is an important source of contrasting projections of impacts and vulnerability for different desert regions and vegetation types. Climate change and direct human land-use pressure are likely to have synergistic impacts on desert ecosystems and species that may be offset, at least partly, by vegetation productivity and carbon sequestration gains due to rising atmospheric CO2. The net effect of these trends is very likely to be region-specific. Deserts are likely to experience more episodic climate events, and interannual variability may increase in future, though there is substantial disagreement between GCM projections and across different regions (Smith et al., 2000; Duraiappah et al., 2005). Continental deserts could experience more severe, persistent droughts (Lioubimtseva and Adams, 2004; Schwinning and Sala, 2004). Vulnerability to desertification will be enhanced due to the indicated increase in the incidence of severe drought globally (Burke et al., 2006). In the Americas, temperate deserts are projected to expand substantially under doubled CO2 climate scenarios (Lauenroth et al., 2004). However, dry-spell duration and warming trend effects on vegetation productivity may be at least partly offset by rising atmospheric CO2 effects on plants (Bachelet et al., 2001; Thuiller et al., 2006b), leading to sometimes contrasting projections for deserts that are based on different modelling techniques that either incorporate or ignore CO2-fertilisation effects. Elevated CO2 has been projected to have significant potential impacts on plant growth and productivity in drylands (Lioubimtseva and Adams, 2004). This projection has been confirmed for cool desert shrub species (Hamerlynck et al., 2002), and both desert shrubs and invasive (but not indigenous) grasses in wet years only (Smith et al., 2000). On the whole, evidence for CO2-fertilisation effects in deserts is conflicting, and species-specific (Lioubimtseva and Adams, 2004; Morgan et al., 2004). In the south-western USA the total area covered by deserts may decline by up to 60% if CO2-fertilisation effects are realised (Bachelet et al., 2001). Limited direct impacts of atmospheric CO2 on nitrogen-fixation have been found in soil biological crusts (Billings et al., 2003), but soil microbial activity beneath shrubs has been observed to increase, thus reducing plant-available nitrogen (Billings et al., 2002). Soil vulnerability to climate change is indicated by shallow desert substrates with high soluble salts and the slow recolonisation of disturbed soil surfaces by different algae components (Evans and Belnap, 1999; Johansen, 2001; Duraiappah et al., 2005). Very low biomass (a drop below a 14% cover threshold) is very likely to make the Kalahari desert dune system in southern Africa susceptible to aeolian erosion (Thomas and Leason, 2005) and, with regional warming of between 2.5 and 3.5°C, most dune fields could be reactivated by 2100 (Thomas and Leason, 2005). Increased dust flux may increase aridity and suppress rainfall outside deserts, with opposite effects under wetting scenarios (Bachelet et al., 2001; Hardy, 2003; Prospero and Lamb, 2003; Lioubimtseva and Adams, 2004), leading to indirect effects on the vulnerability of remote regions to climate change. About one-third of the Sahel was projected to aridify with warming of 1.5 to 2°C by about 2050, with a general equatorward shift of vegetation zones (van den Born et al., 2004; Box 4.2). Alternative climate scenarios show less pronounced changes (van den Born et al., 2004). Episodic wet periods may increase vulnerability to invasive alien species and subsequent fire outbreaks and this, combined with land overuse, will increase vulnerability to degradation and desertification (Dukes and Mooney, 1999; Dube and Pickup, 2001; Holmgren and Scheffer, 2001; Brooks et al., 2004; Geist and Lambin, 2004; Lioubimtseva and Adams, 2004). Wet spells with elevated humidity and warmer temperatures will increase the prevalence of plant diseases (Harvell et al., 2002).